Desert Hills 3 East is an active adult neighborhood in Green Valley, Arizona. Residents of this 91-home neighborhood enjoy an established homeowners association (HOA) as well as access to 13 recreation centers that encompass Green Valley Recreation (GVR). Homeowners pay a GVR fee that includes an array of activities, events, classes, and more. Green Valley, Arizona is a popular area for active adults as the majority of neighborhoods within the city are age-restricted or age-targeted to 55+ homebuyers. Residents of Desert Hills 3 East enjoy access to all of the fully stocked facilities throughout Green Valley Recreation (GVR). The GVR organization collects a reasonable annual fee that offers members access to 13 centers. These facilities include state-of-the-art fitness centers with aerobics studios as well as indoor and outdoor pools. There are also many courts for tennis, pickleball, shuffleboard, bocce ball, volleyball, and racquetball spread throughout the area. Homeowners can dabble in various hobbies because there are studios for arts and crafts, lapidary, woodworking, or photography. This active adult playground also includes restaurants, computer labs and meeting rooms, which are ideal for hosting parties or attending club events. 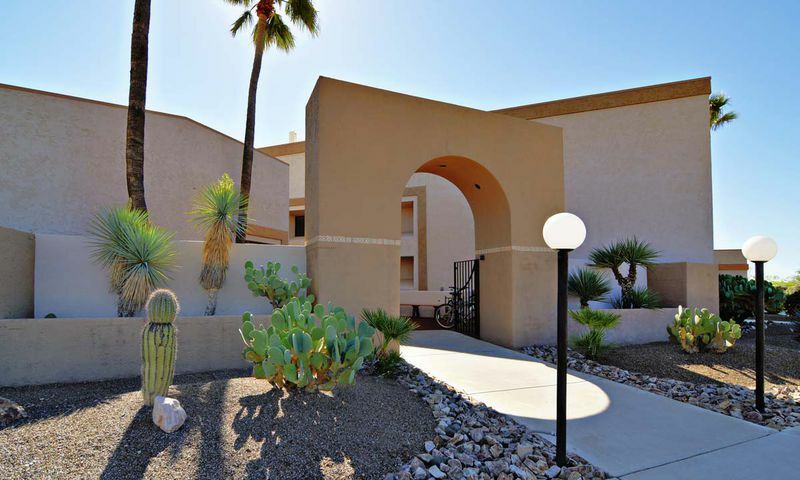 Desert Hills 3 East s homeowners enjoy access to scenic outdoor areas like ponds and picnic areas. An 11,000 square-foot outdoor entertainment space is a great place to watch a concert or attend a summer party. This Green Valley age-restricted neighborhood consists of 91 attached homes. Desert Hills 3 East offers affordable home options for active adults that range in size from about 1,100 to over 1,400 square feet. These resale homes were mostly built in the early 1980s with two bedrooms, two bathrooms, and an attached garage. All homes include single-story living and low-maintenance exteriors. Active adults who live in Desert Hills 3 East enjoy a carefree lifestyle among like-minded neighbors. GVR has a full lineup of classes, parties, and special events held throughout the year. Each month a series of performers come to GVR for concerts, as well as lectures, movies, trips, and tours provide great opportunities for art and culture. Residents can take up a new hobby by attending a class that focuses on many special interests like painting, ceramics, Spanish, jewelry making, and more. Not only do residents enjoy all that GVR has to offer, residents of Desert Hills 3 East enjoy social events in their own neighborhood. The HOA hosts themed parties and events like a Bon Voyage Party and Welcome Back Social, where neighbors can get to know each other. Area Green Valley is a census-designated place in Pima County, Arizona. It is 20 miles south of Tucson and 40 miles north of Nogales, Mexico. Baby boomers from all over relocate to Green Valley because the area is made up mostly of active adult communities. Homeowners have access to over 21 healthcare facilities in the Green Valley area. When traveling is on the agenda, easy access to Interstate 19 makes driving a breeze while Tucson International Airport is just 30 minutes away. Whether hiking and enjoying the great views of The Santa Rita Mountains or teeing up at one of the many area golf courses, Desert Hills 3 East is a wonderful 55+ community in Green Valley, AZ. There are plenty of activities available in Desert Hills 3 East. Here is a sample of some of the clubs, activities and classes offered here. Desert Hills 3 East offers affordable home options for active adults that range in size from about 1,100 to over 1,400 square feet. These resale homes were mostly built in the early 1980s with two bedrooms, two bathrooms, and an attached garage. All homes include single-story living and low-maintenance exteriors. Please Note: Floor plans are not available at this time. Green Valley is great for retirement. The area caters to retirees, there is plenty to do and the homes are affordable. For the most part it doesn't matter what community you choose just make sure you get access to all the various amenities and clubhouses. Some communities in Green Valley do NOT give you access to all the good stuff! 55places.com is not affiliated with the developer(s) or homeowners association of Desert Hills 3 East. The information you submit is distributed to a 55places.com Partner Agent, who is a licensed real estate agent. The information regarding Desert Hills 3 East has not been verified or approved by the developer or homeowners association. Please verify all information prior to purchasing. 55places.com is not responsible for any errors regarding the information displayed on this website.